JW Aluminum bills itself as "The Leading Aluminum Rolled Products Company in the World." In recent years, JW Aluminum began a campaign, both internal and external, to update its corporate identity. In the world of molten metal safety is everything, and the fastest and most effective way to nurture that safety-conscious culture was through imagery — a picture is worth a thousand words, right? After creating an "official" set of logos, establishing a color palette and identifying a corporate font family by their Communications Director, I was asked to help create a set of brand guidelines, as well as create and implement an icon-based series of communications. 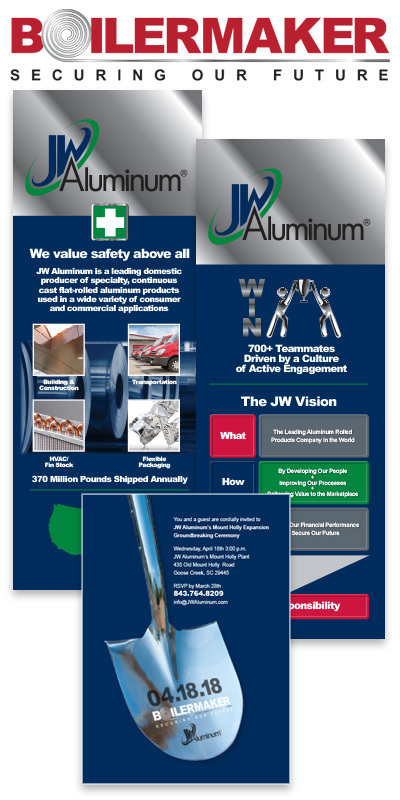 Print projects for JW Aluminum have ranged from their annual Safety Calendars to posters, greeting cards, invitations their corporate newsletter, "Alumination" and trade show signage. Projects have ranged in size from standard business card to 16-foot banners. A series of posters conveying the company's mission, vision and culture was also created in multiple sizes to adorn the walls of their plants across the nation, keeping JW's goal of a 100% accident-free workplace top of mind to its teammates. As a result of the recent manufacturing boom in the USA, JW Aluminum's Mount Holly, SC plant is constructing a new 220,000 square foot building, resulting in 175 million pounds of new capacity and adding 50 new jobs to its workforce. The project represents the most significant capital investment in domestic continuous cast technologies and capabilities since 2001. The expansion has been labeled Project Boilermaker and its publicizing has required logo design, recruitment banners, groundbreaking invitations and more. 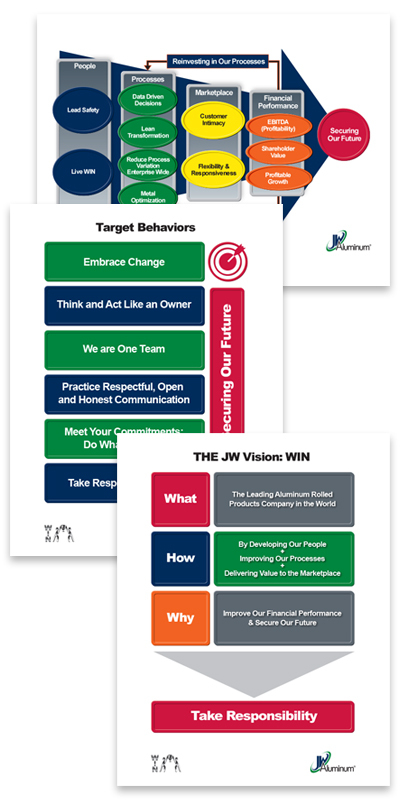 Posters depicting JW Aluminum's Vision, Target Behaviors and Strategy adorn the hallways and break rooms of their plants around the country, ranging from standard letter size to 48" X 60". All incorporate the refreshed branding elements. JW Aluminum's external messaging carries the same color palette and iconography as the internal communications. Shown above are the logo for Project Boilermaker, job fair recruitment banners and an invitation to the groundbreaking for Boilermaker.